Experience more winning moments with Knockout Poker! Think you’ve got what it takes to eliminate the competition and prove you’re king of the poker ring? Register for Knockout Poker tournaments to take a swing at cash prizes now! 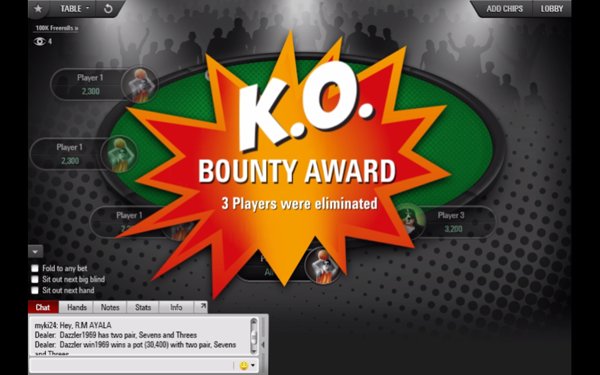 In Knockout Poker tournaments, a cash bounty is placed on every player who registers. Every time you eliminate somebody, you win a cash prize. Knockout Poker tournaments are special MTT and Sit & Go tournaments where the prize money is split, with a part going to the overall prize pool, and the other part distributed among players for each opponent they knock out. Unlike traditional MTTs and Sit & Go’s, you don’t need to finish in the money to earn a cash prize. You can boost your bankroll every time you knock out an opponent during each Knockout Poker tournament. 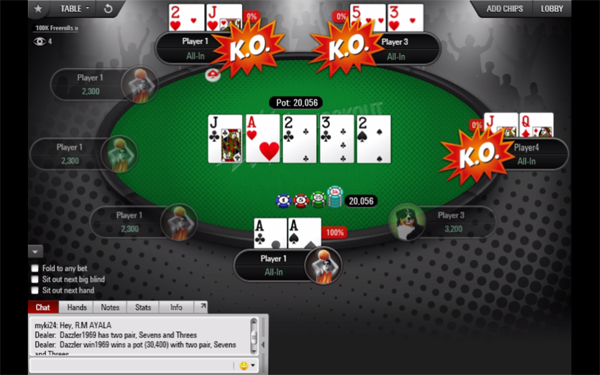 To get started, select ‘KO Poker’ tab in the main game lobby. 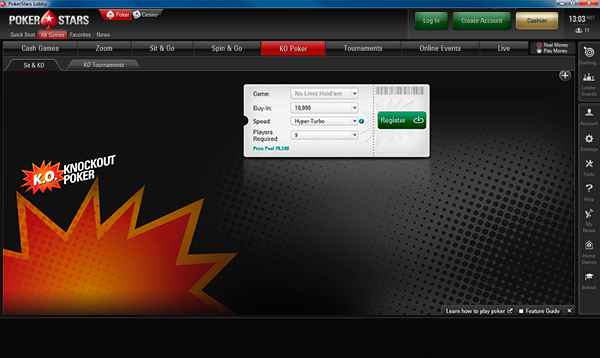 Choose between ‘Sit&KO’ and ‘KO Tournaments’ via the available tabs, then your game type, buy-in and game speed. When you’re ready, click the ‘Register’ button, and start to KO the competition! Once you have chosen your buy-in and the game type you want to play, you will be seated at a tournament table. As soon as you knock out a player (or players) you will get a notification at the table telling you how many players you have eliminated, and how much you’ve won as a cash prize. Knockout Poker tournaments are offered in a wide range of formats, including Turbo, Hyper-Turbo and Regular. Still don’t have an account with us? Download our free software to get started now. If you have any questions about Knockout Poker tournament, contact Support.